Seismic dispersion: What does it really mean and what causes it? Body waves (to some extent) and especially surface waves show dispersive characteristics during propagation. In Dr. Christopher Liner's book [Elements of Seismic Dispersion (2012)], this phenomenon is quickly attributed to propagating seismic energy being frequency-dependent. I've heard this phrase for a long time, and I am still unsure how to visualize and/or quantify it for the sake of really understanding this phenomenon. Indeed, why can't one phrase it as being wavelength-dependent as well? Also, for both surface and body waves, what are the primary factors that cause/generate seismic dispersion? Time, Frequency, Wavelength and Wavenumber are very closely tied to each other. Our wavelength lambda is directly tied to the frequency f and the velocity v within the rock. Lambda and f are properties of the wave. v is a rock property. The equation is lambda = v / f. So in the sense of "dependence" everything depending on lambda equally depends on wavelength. It's just the inverse after all. Let's build some intuition here. Seeing there is no other place, the dispersion is crammed into v all the way. Take an average sandstone with some average pores. We can send waves at a lot of wavelengths through. Imagine a wave that has a wavelength just barely below the size of the pores (ca. 1mm). That wave will "see" a very different rock than a wave with the wavelength of around 1cm. That wavelength will see a very different rock than a wave at 1m that will not see any of the pores. This wave will probably even average over several heterogeneous rock layers. This phenomenon is called apparent dispersion. Additionally, the rock matrix itself has dispersive properties, which is a fancy way of saying that some waves have it easier travelling through the rock itself. And now we're getting into the fun part of physics. The part where we have to leave the "easy physics". We always assume seismic waves make infinitesimal (small) elastic changes when travelling through rock. 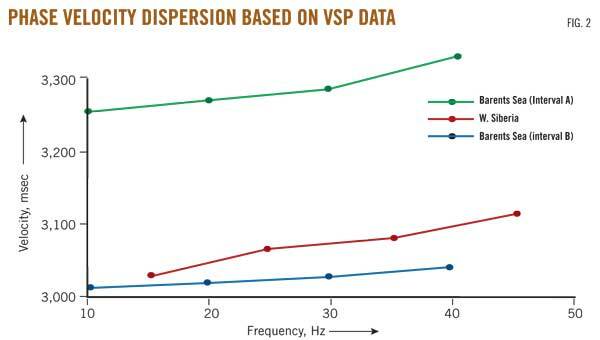 For seismic dispersion, it doesn't work anymore. We have to consider anelastic behaviour there. It also leads us to anisotropy. And lastly, it's tied with seismic attenuation. Let's stay with anelasticity for this answer. Basically, this means that some deformation is irreversible. Larger frequencies and therefore, smaller wavelengths are more prone to dispersion in the Earth. Most mechanical waves are transported via frictional interfaces at the grain. Well cemented rock behaves more "elastic" than loose layers. The transfer of small wavelengths is more similar to long wavelengths when the rock is responding similarly on all size scales. That is the case for cementation, as the stiffened grains behave more like the stiff layers they are a part of. If grains transfer small wavelengths just via friction, the larger wavelength behaves very differently, as most of the large-scale geology isn't too dependent on friction to hold rocks together. The easiest analogue is the prism. You shine a white light at a prism and get the colours to separate. This is due to wavelength-dependent (or frequency-dependent) refraction of the incoming wave. 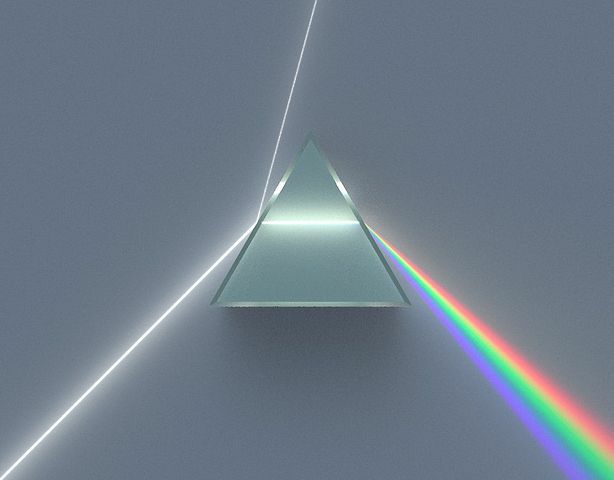 The white light is split into all the wavelengths in the prism, giving the separation of colour. You can observe the same happening for seismic data. Instead of a nice focused "seismic beam", the beam is dispersed along the receiver surface according to its wavelength, just like the prism. Frequency- or wavelength-dependent are indeed equally valid terms but frequency is in practice more measurable than wavelength, so much so that seismic wavelength is calculated not measured. Dispersion is caused by material density, the material the waves pass through will, depending on density, pass certain waves, and wavelengths of those waves, better than other waves and wavelengths. Describing my visualisation of the effect is difficult, the best way to look at the effect is to find seismic traces of the same earthquake from various ranges. This will show the different wave fronts spreading out as they travel. This is largely due to their compatibility with the material they pass through. I find it comparable to structural resonance there are frequencies that interact well with the rock they're travelling through, they get a boost, and there are those that interact less well, they get held back by the material they're travelling through. Not the answer you're looking for? Browse other questions tagged seismic or ask your own question. What does 'reghosted' mean in a seismic cube label?